According to US military officials, the USS Bataan and USS Peleliu are used as prison ships to hold captives suspected of terrorist activities, including “American Taliban” John Walker Lindh (see December 14, 2001). Both vessels are operating in the Indian Ocean. The use of US naval vessels as prison ships is kept extremely secret; the press will not learn of the incidents for years, and even then, details will be sketchy. Questioned in 2004 about the use of US military ships as “floating prisons” (see June 2, 2008), Rear Admiral John Stufflebeem will say: “I don’t know the specifics. Central command determines for either medical considerations, for the protection of those individuals, for the isolation in the sense of not having forces that would try to come get somebody out of a detention center, for a security aspect, and obviously an interest to continue interrogation.” The US may also use ships in and around the British-controlled island of Diego Garcia, in the Indian Ocean, to hold prisoners indefinitely and “off the books.” And the US may use its ships for what is called “extraordinary rendition”—the secret transportation of prisoners to foreign countries where they can be interrogated and tortured in ways proscribed by US law. 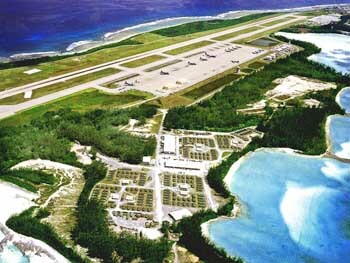 US and British officials will repeatedly deny the use of Diego Garcia in any such “floating incarcerations” or renditions. [Guardian, 6/2/2008] One reason for the use of naval vessels as prison ships may be necessity: the US is capturing scores of prisoners in Afghanistan, but the first detainee facilities at Guantanamo Bay, Cuba will not open until January 2002 (see January 11, 2002). Mohammed Nazir Bin Lep (a.k.a. Lillie). [Source: Defense Department]Hambali (a.k.a. Riduan Isamuddin) is arrested in Thailand in a joint US-Thai operation. He has been considered the operational leader of al-Qaeda in Southeast Asia. He was involved in the Bojinka plot in 1995, attended the January 2000 al-Qaeda summit in Malaysia (see January 5-8, 2000), and was said to be involved in the 2002 bombing of two nightclubs in Bali, Indonesia (see October 12, 2002), the 2003 bombing of a Marriott Hotel in Jakarta, Indonesia (see August 5, 2003), and other similar acts. He is taken into US custody and is said to quickly and fully cooperate with his captors. [Chicago Tribune, 12/7/2003] According to the Washington Post, at some point he will be transferred to the US naval base at the British island colony of Diego Garcia, where the CIA is believed to have a secret interrogation center. [Washington Post, 12/17/2004; Washington Post, 1/2/2005, pp. A01] Two of Hambali’s associates - Mohamad Farik Amin (a.k.a. Zubair), and Mohammed Nazir Bin Lep (a.k.a. Lillie) - are arrested with him. Both are Malaysians and are said to be al-Qaeda operatives. Supposedly they were members of a four person suicide squad working for Hambali and Khalid Shaikh Mohammed to hijack an airplane (see October 2001-February 2002). [Time, 10/6/2003] The US will later classify both of them, and Hambali, as about a dozen of the top al-Qaeda operatives in US custody (see September 2-3, 2006). 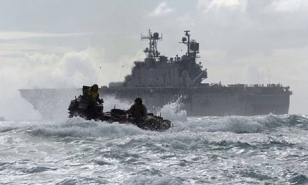 The USS Peleliu. [Source: Zack Baddor / AP]Human rights groups claim that the US is operating “floating prisons” as detention facilities for prisoners taken in the “war on terror.” The groups claim that the US is keeping prisoners aboard ships such as the USS Ashland, the USS Bataan, and the USS Peleliu (see December 27, 2001), and say that the Americans refuse to admit to the existence of such detainees. The human rights group Reprieve has asked that the US list the names and whereabouts of such “ghost detainees” held aboard US vessels. The existence of the detainees has come to light from a number of sources, including statements from US military officials, information provided by the Council of Europe and other parliamentary bodies, and prisoner testimonies (see June 2, 2008).